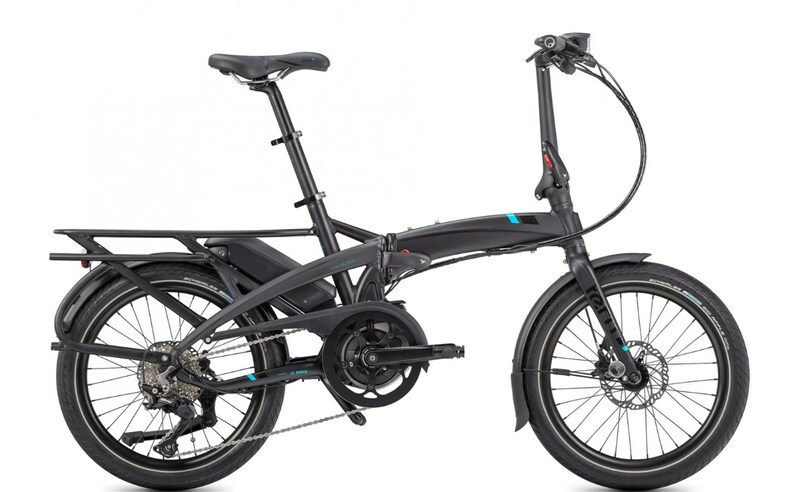 The Tern Vektron S10 is a 20″ wheel, fully folding electric bike, powered by Bosch. Designed for a multitude of uses, the Vektron S10 is equally at home in the urban jungle or on the boat, caravan or motorhome. Powered by Bosch’s super strong crank drive motor, the Vektron S10 delivers a smooth yet strong pull on even the most demanding terrain and steepest of climbs. The large 400Wh battery ensures more than ample range for all journeys. This little beast will provide endless hours of enjoyment. It’s so portable, and simple to fold. It’s lightweight aluminium frame ensures strength as well as maneuverability. A simple yet reliable mechanism known as the ‘OCL+™ Frame Joint’ allows the Vektron S10 to become half its size in a matter of seconds. This unique piece of engineering is so strong that it exceeds ISO 4210 and EN 15194 testing requirements. The Vektron S10 uses ‘N-Fold™ Technology’ allowing a complete and fast fold in three easy steps. Retaining straps ensure the bike stays folded. Nothing could be simpler. Furthermore, with the handlebar folded to the outside of the package, the Tern can also roll when folded for easy transport. Part of the Vektron S10’s genetic makeup features an ‘Andros™ Stem’. This is Tern’s own unique adjustable stem that allows the rider to rotate and set the handlebars as required without the need for tools. It takes seconds to adjust, and means the bike’s geometry is a perfect fit for all. A telescopic seat-post ensures further flexibility. There’s more clever design too with a special saddle that allows the user to carry the bike comfortably via the shoulder. The underside of which has an integrated shoulder pad that also acts as a grip when rolling while folded. It has its own side-stand as well as an ‘A’ support underneath the motor on which to rest the bike in its folded state. Gearing is both smooth and accurate thanks to a nice Shimano Deore 10-speed derailleur. ensuring excellent hill-climbing. Braking is highly effective thanks to the Shimano Deore hydraulic disc brakes front and rear, and ensure the Vektron S10 responds when asked. Keeping the rider fully comforted are the highly absorbing Schwalbe Big Apples. No need for suspension forks on this little gem! These huge balloon tyres ensure every bump and hollow are effortless. Ergon GP10 grips enhance rider comfort and support the hands precisely. Lighting is provided via a powerful 41 lux, 150 lumen Valo Direct lamp sited inside the handlebar stem. This ensures it’s safe from knocks, bumps, and theft as well as being protected while folding. The Bosch Purion LCD mounted to the left of the bars provide clear and succinct rider information. Bosch drives have four levels of power assistance that are easily changed.